Enjoy all the comforts of home! - Right across from Silver Dollar City! The quality of our lodge is not what you would typically expect to find in most cabins. This is actually a gorgeous fully furnished home! Our lodge sleeps up to 22 people - Ideal for large groups, retreats or family reunions. Each of the six bedrooms is actually a master suite. - 2 Bedrooms each have a King size bed. - Two bedrooms each have 2 Queen size beds. The main and lower levels each have a sofa sleeper. In the bedrooms are top of the line mattresses. They all have their own private bath including 'JETTED-TUBS', showers and closets. Every bedroom has a 32" flat screen cable TV. 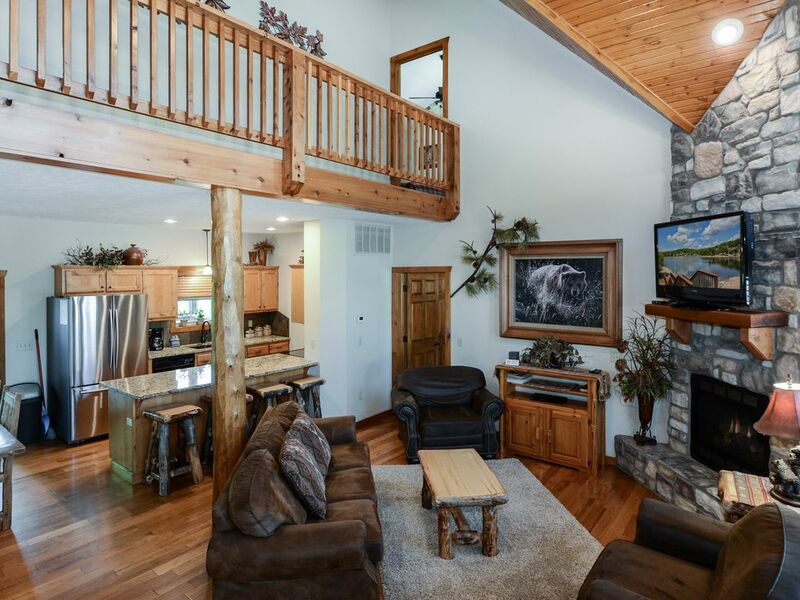 The Lodge has soaring two story ceilings in the great room with a stone gas fireplace, upscale lodge style furniture and large flat screen cable TV. Our completely furnished kitchen includes granite tops, beautiful wood cabinets, 2 full size refrigerators, flat top stove and oven, microwave, dishwasher and garbage disposal. There are more than enough matching dishes, heavy stainless cookware and silverware. Even the kitchen utensils and small appliances are high quality. The laundry room has an oversized front-loading, high capacity washer/dryer. Step out on the screened in porch with additional seating to eat or relax with wonderful views of nature. The walk out lower level has a large common area in the center of two bedrooms - each with it's own bathroom. There is a large flat screen cable TV, DVD player, DVD library, game table, board games and 'NINTENDO Wii', X-Box 360, Games and extra controllers. We even have a solid oak, slate top 'POOL TABLE' ! Adding to the beauty and charm of this home are the furnishings. It is filled with beautiful upscale rustic furniture. High end furnishings, flat screen cable TVs, DVD players, free wireless internet, video games, natural slate and hardwood flooring are just some of the upgraded touches to enjoy during your stay. Outdoor on-site amenities include a GREAT Swimming Pool, Kiddie Pool, Hot Tub, Playground, Fitness Room and Clubhouse right by our home! Our guests also have free access to additional offsite indoor pools, outdoor pools, hot tubs, tennis courts, basketball courts and playground areas. There are no additional fees for these amenities. Boat rental slips are available subject to availability at Indian Point Marina - Contact in advance to reserve a slip. Our home is nestled away in the rolling hills above Table Rock Lake. This Lodge was designed with your family's vacations needs in mind. Special personal touches, a private and secluded atmosphere, along with nearby amenities makes our Lodge a truly unique place. Conveniently located across from Silver Dollar City! We are off Indian Point Road, just down the road from Table Rock Lake's Indian Point Marina and close to the Branson Strip. Each bedroom has their own private bath including jetted-tubs and showers. Wonderful time in a beautiful home! This beautiful home worked perfectly for our group. We really liked the location it was close to everything but not on the busy strip. We would highly recommend staying here and would definitely stay again. Thank you! Beautiful home with lots of space. We had 8 adults with 4 children and 2 babies. Basement with pool table was awesome!! Basement also was spacious for kids to watch TV and play cards, while living space on the main level was quiet for us older ones to sit and visit. We had a wonderful time and Bryan was super kind to work with. We would stay again while visiting Branson. Take advantage of their winter rates! There is still so much to do right now you can't do it all! We wanted to take advantage of the cheap winter rates and just have a relaxing weekend. Surprisingly there lot of things open and more than we could do in our short stay. We took the kids to a brand new place at the Branson Landing that just opened called Andy B's and they loved it! It is for all ages and they have the coolest bowling lanes, tons of tv's, games, a very nice place to eat and even an escape room! The kids can't quit talking about it. We also went to a super cool arcade right across from it. The next day we went to Fritz's Adventure another must do spot. There is a climbing wall, play tunnels, laser room and lots more than we could do. They have an awesome wind tunnel that simulates skydiving! We even managed to squeeze in a swim at the indoor pool. We could not spend nearly enough time everywhere or do all we wanted but we had the best time! We are planning to come while rates are still cheap but spend at least an extra day or two. We can't thank you enough for offering your home to our family it was so beautiful! We will be getting in touch soon. Until next time!!! Loved the Christmas tree! This was the perfect place to stay! When we first arrived we loved walking in and seeing the Christmas tree! It really added to our holiday trip. This home is very nice and the furniture, beds and stocked kitchen are by far the best we have ever stayed at. You can tell these owners care about their guests unlike some places we have stayed. We would not hesitate to return or recommend and we are actually planning to return this spring. The location could not be better and we loved being literally 2 minutes from Silver Dollar City. If you are planning a trip to Branson this is the place to stay! Thanks again for allowing us to rent your beautiful home and we will be back soon! The property is in an amazing location and is perfect for a large family get together or just a family that wants to spread out. We loved the Christmas decorations and the pool table was a hit with the entire family. We would definitely stay here again. We had a wonderful stay in Branson here. There was so much to do, and the location of the house was amazing! We were very impressed with the bedrooms and living space available. LOCATION ! ..... LOCATION ! ..... LOCATION ! There are a dozen outstanding golf courses located throughout Branson (3 of the top 10 courses in Missouri) including LedgeStone, Buffalo Ridge Springs, Top of the Rock and Branson Hills Golf Club. Some of these beautiful courses were designed by Jack Nicklaus and Tom Fazio. Table Rock Lake, well known for its crystal clear water and incredible fishing, is just down the road at the end of Indian Point. Indian Point Marina (only a few minutes away) is a full service marina. They offer a scuba diving center, boat and jet ski rental. Boat rental stalls, live bait and a tackle store are available. Lake Taneycomo (famous for its trout fishing) and Bull Shoals are just a few miles away. - Minimum stay may be required - Contact us for current availability - Until confirmed rates are subject to change without notice - Holiday stays may have a premium charge per night _______________________________________________________________________ To search internet the for our website copy: VacationHomesInBranson 913-206-1620 - Hopefully there will not be any issues that would prevent anyone from coming however... There is trip insurance available in case something unexpected happens.